This document assumes that the media items are ready to upload and publish. It is also recommended that the relevant media-level metadata is prepared and collected at this point. It is best practice to enter media-level metadata now, but it can be added later if needed. 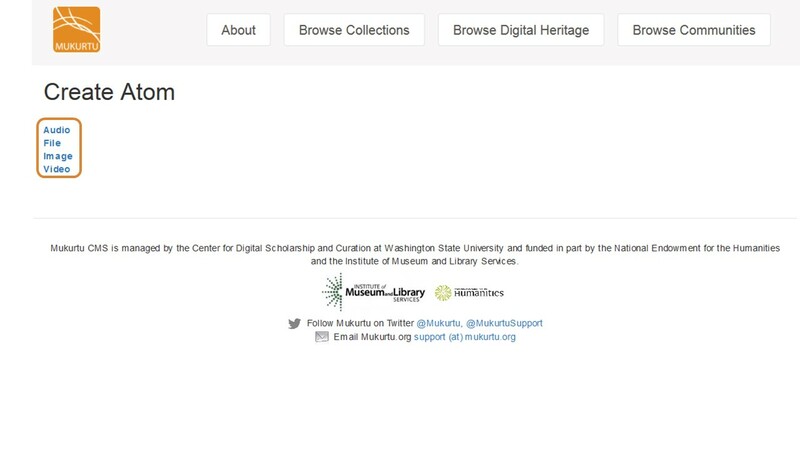 There are two ways to access the media import feature: as a Mukurtu Administrator through the Dashboard, and as a Contributor through the Digital Heritage Item editor. Both methods work functionally the same and offer the same controls and features. This document shows how to add media assets as a Mukurtu Administrator. 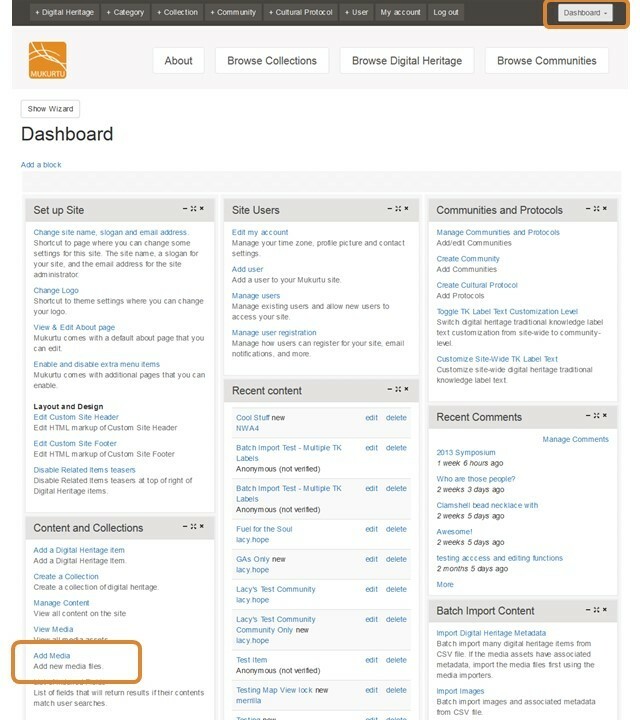 To see how to add media assets as a Contributor, read the support article Working with Media Assets as a Contributor. The media importer is accessible through the dashboard. 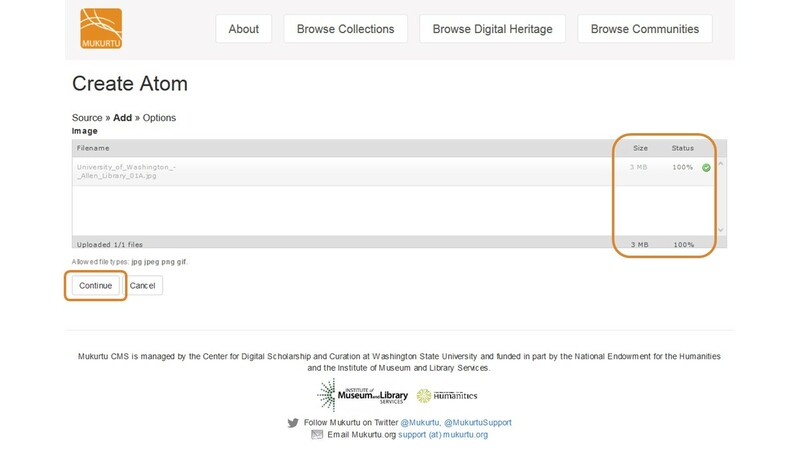 Click the Add Media link in the Content and Collections box . Select the appropriate media type. Only media assets of one type can be uploaded at a time (image, audio, video, document), but different file formats of the same media type can be uploaded at the same time. Multiple files can be uploaded at a time. Files can be added by browsing through the importer, or by drag-and-dropping from the computer. At the bottom of the importer window is a list of compatible file formats. Click on Add Files to locate the files on the computer. After all files to be uploaded have been selected, click Start Upload. Progress of each file upload will be shown in the browser - do not navigate away, close the window, or click Continue until ALL files have finished uploading. Depending on file size and number of files, this may take a little while. When all files have been uploaded, click Continue. Now media-level metadata can be added. Only Title is a required field, but it is best practice to include as much metadata as possible about the media assets. Metadata is entered individually for each item. Media-level metadata for each file now can be entered manually now, or batch imported later if many media assets will need metadata. 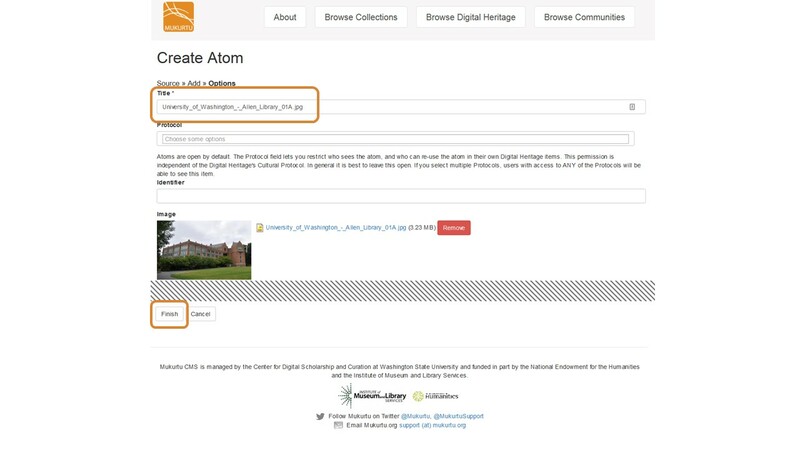 Note: the fields vary by media type, and there are more metadata fields for images than shown in the screenshot below - screenshot was cropped for size. When all metadata is entered, click Finish. 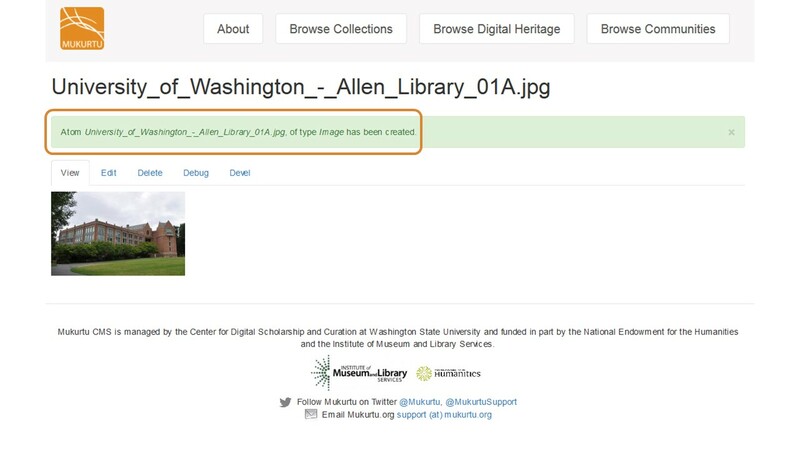 Media assets and metadata will be saved and a confirmation page will be displayed. 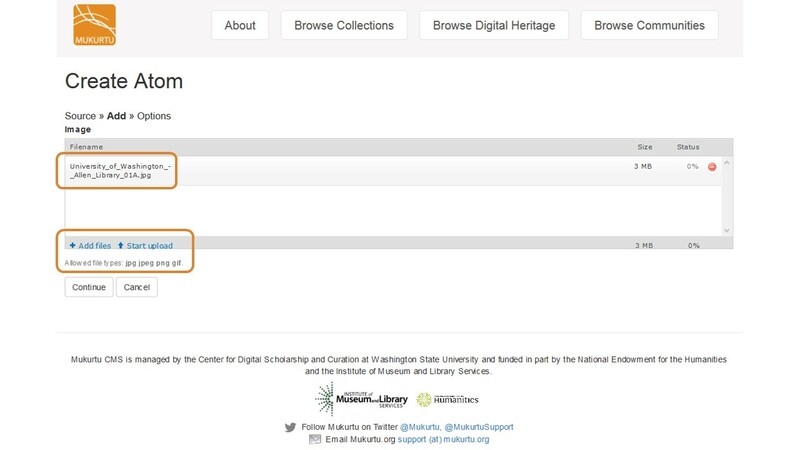 The media assets can now be used in digital heritage items, or to customize the site.